Gary Presley: So What about This Kindle Thing? So What about This Kindle Thing? Right now I have better use for spare coins than investing $130 in a Kindle device, but since I'm considering uploading a collection of essays into that book format, I was curious about the whole dynamic. A few days ago another writer mentioned that Kindle "reader" software can be downloaded for a personal computer, or a Mac or an iPhone, for that matter. It's a relatively small file, the software, and so after installing it, I thought I might download a book as well. 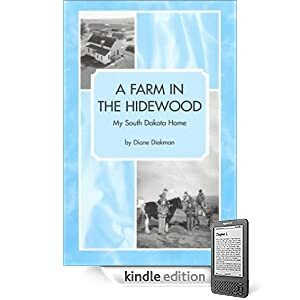 The program I downloaded did include several books -- Aesop's Fables, Treasure Island, and Pride & Prejudice -- but I wanted to experience the downloading process, and so I chose my writing friend, Diane Diekman's, childhood memoir, A Farm in the Hidewood: My South Dakota Home. The memoir was one my computer so quickly I wasn't sure it had downloaded. The Kindle software is intuitive, and so I had no trouble getting started and enjoying the book. In fact, since it's a relatively short volume, I finished A Farm in the Hidewood this afternoon. Font size and presentation make for easy reading, although my laptop does have a 17-inch screen. I am not sure how any book would look on the Kindle itself, which has a significantly smaller screen. Diane's book, of course, is a winner, a look at a period in our world that a kid with a Kindle, or an iPod, or his own computer, would think as primitive as Abe Lincoln's log cabin upbringing. Diane grew up in rural South Dakota, attended a one-room school, and was an integral part of her family's farm life. Diekman's second memoir about her life as a U.S. Navy aviation maintenance officer is also on Kindle. She is the author of a biography of country music legend Faron Young, and her biography of another country music Hall of Fame artist, Marty Robbins, will be published in 2012 by The University of Illinois Press. Learn more about her writing on her website.